This one could easily go into the "knock your socks off" category! Wonderfully rich and bold colors, bold contrast, nice comp, details where you really need it the most, … I like it! I tend to favor mountain/nature scenes, great architectural/cultural scenes or interesting portraits. But I enjoy a great floral close up and you have outdone yourself with your tulip series. I like the two tulips in the center as the focal point. Very nice! 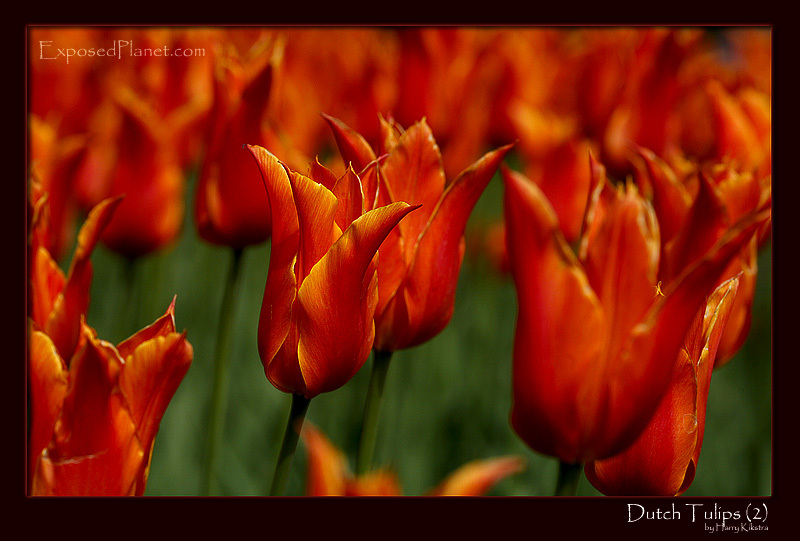 The story behind "Orange Tulips in the Netherlands"
For now this is the last one of the Dutch Tulips as you might get bored with them, but maybe later this year I will add some more. I just wanted to give some counterweight to all the bad news from the past week. I love the USA with its beautiful nature and its people and have many friends there, but I like the fact that over here in Europe it is easier to buy flowers than a gun and bullets, both off-line as well as online. Call me a hippie, but what if an amendment would be The Right to Grow or Receive flowers? It’s either that or all teachers should wear guns in school to protect them from students and vice versa. Imagine having to give a bad grade then..
Again, it is amazing how strong the colours were, all of the previous pictures I had to desaturate a bit as they looked a bit fake and oversaturated straight from the camera. Anyway, I am happy that these grow so close to home and will go out now to buy a few..